In this digital age, almost every electronic device is available (and better) wirelessly. Not only is it more convenient, but it also assures you compatibility of both devices. The Inland Pro Wireless 2.4 GHz is one of the best budget keyboard and mouse combinations on this list. But even with its modest price you still get one of the best products on the market, with one of the best features for wireless devices. Both devices work on a 2.4 GHz frequency with a working distance of 10 meters, which is the most distance you can get on that frequency. This would be perfect for users that want to have access to their computers while sitting on a couch that is 5-6 meters away. The keyboard is spill-resistant to protect it against damage and it has a standard keyboard layout. The optical mouse is wireless and requires a USB port to connect to your computer. The small USB receiver can be stored at the bottom of the mouse when not in use. Both the mouse and keyboard requires 1 AA battery for power. 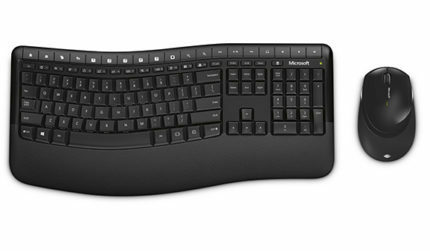 The Microsoft Wireless Comfort Desktop is one of the best wireless keyboard and mouse combo packs from Microsoft. For a very affordable price, you get an ergonomically designed keyboard and an optical mouse. This keyboard was made for comfort and ease of use. It is why it is among the most preferred wireless keyboards on the market. The Microsoft keyboard also features a built-in palm rest so you can rest your hands while typing, and its ergonomics are designed to be compatible for ambidextrous use. There are also programmable hotkey buttons located at the top of the keyboard for a more customized interface. The mouse also features the BlueTrack Technology which allows the device to be compatible for use on any surface. Other features include the AES technology (Advanced Encryption Standard), which helps to protect your information by encrypting your keystrokes. Both the keyboard and the mouse require 2 AA batteries for power, and both devices connect via USB nano-receiver. The Anker CB310 offers a sleek and convenient mouse and keyboard combo. Both devices are designed specifically for the Windows Operating System, but it is compatible with Apple OS as well. The keyboard features an ergonomic palm rest and programmable multimedia hotkeys. It is also splash and water resistant. The mouse includes 3 DPI levels of 1000, 1500, and 2000. The two additional thumb buttons work on the Windows Operating systems but may not be compatible with other operating systems. Both devices connect to a USB nano-receiver device that can be stored at the underside of the mouse. Both devices are also one of the best mouse and keyboards that feature an energy saving mode to save up for battery life. There are 4 levels of energy saving modes, each activated when the devices are not in use. The first mode activates after 15 minutes of inactivity. The HP Wireless Elite is one of the most beautifully designed wireless mouse and keyboard combo packages. The design of both devices is sleek and clean, with smooth lines and slim features. But the devices are more than just its aesthetic look. The keyboard is designed with scissor-style keycaps for quiet typing and faster keystrokes. Both devices work on a 2.4 GHz frequency for a maximum wireless range. The keyboard also features function keys for media and other applications. The keyboard can also be adjusted for your preferred height and angle, and it also features a unique battery life indicator, so you know how many days or hours you have left on your device before having to change batteries. The optical mouse has a scroll wheel for better efficiency and a 1000 DPI sensor. These devices also connect through an HP nano-receiver, which allows up to 5 HP devices to connect to your computer. Both devices require AA batteries (included in the package). With most keyboard mouse combo packages on this list, the keyboard is the focal point, with the mouse being an added perk to the combo. 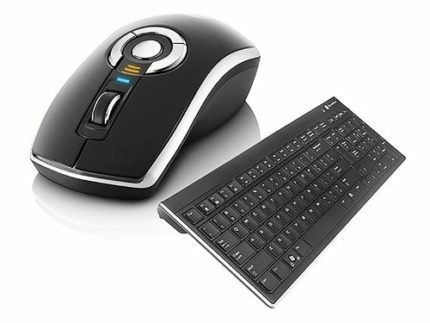 But with this package, we have the mouse being the focal point and the keyboard being the added device. The Gyration Rechargeable Wireless Mouse with Wireless Slim Low Profile Keyboard offers one of the most versatile and advanced input devices. The custom PC mouse is the highlight of the pair. It works on a desktop surface, but it can also be used when help up, or on air. MotionTools Technology reads your hand gestures and uses your movements to control the mouse. This technology allows you to use the mouse as a highlighter, a pen, or laser pointer. Included in the package is a 105-key sleek “low profile” keyboard. Both devices also make use of long-range FR technology, which allows connectivity for up to 30 meters, without line of sight limitations. While the mouse is very versatile, the combo comes with an expensive price tag. The Air Mouse is rechargeable while the keyboard requires 4 AAA batteries (which are included). 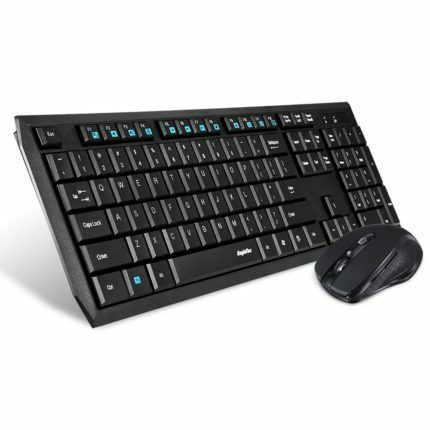 The Logitech Wireless Desktop MK710 is one of the best wireless keyboard and mouse combo packages offered by Logitech. The combo pack includes the MK700 keyboard and the wireless M705 Marathon mouse. Both devices have ergonomic design and structures for comfort and efficiency. The keyboard features a wrist rest for your hands when you’re typing, and the keys themselves are designed with the Logitech Incurve concave shape for better comfort on your fingertips when typing. The keyboard also has an LCD dashboard that informs the user of the key locks (caps lock, number lock, and scroll lock) but it also lets you know the status of the battery power. The 5-button laser mouse (two thumb buttons) is also equipped with a hyper-fast scroll wheel that allows you to move through long documents and pages at a faster rate. Both the keyboard and the mouse connect through the Logitech Unifying receiver, which allows up to six compatible devices through the same receiver. While both devices are powered by batteries (2 AA batteries each) they keyboard has a battery life of 3 years, easily the lengthiest of any battery powered keyboard on the market. 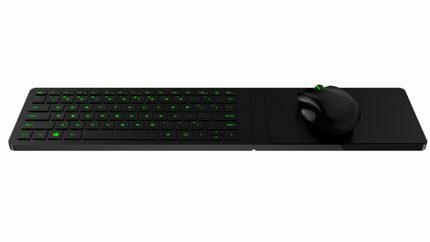 The Razer Turret is one of the best (if not the best) wireless gaming keyboard and mouse combo’s in the market. Razer has long been one of the best manufacturers for gaming pc mouses and gaming keyboards, and they have not disappointed with this pair. The keyboard comes attached with a lapboard that acts as the mouse pad for the mouse. The lapboard is attached with a hinge and can be folded with the keyboard and stored on a portable charger when not used. 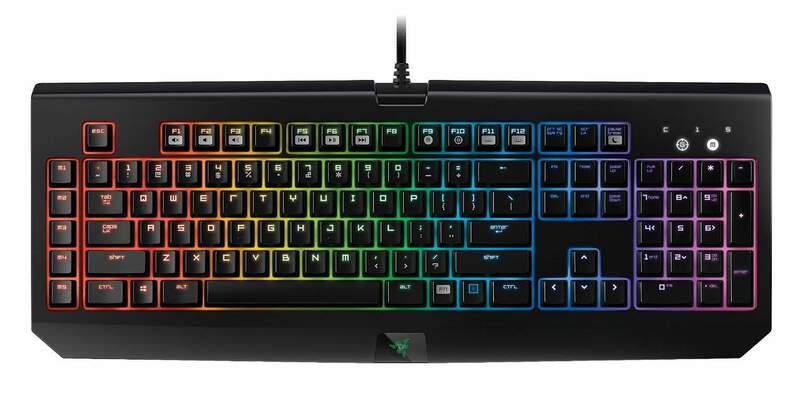 The keyboard is designed for gaming, with anti-ghosting capability for up to 10 simultaneous button presses. The keys have a chiclet-style for comfort and faster reaction time. The gaming mouse has a 3500 DPI laser sensor for faster reaction time when gaming. The mouse pad on the lapboard is also magnetic, preventing your mouse from slipping when in use. Both devices connect via dual wireless connectivity with both Bluetooth wireless LE and 2.4 GHz adaptor. Despite being designed for gaming, both devices are completely functional for browsing or everyday computer use. Both devices are also powered by rechargeable high capacity lithium polymer batteries and have a battery life of 4 months. Despite the considerable price tag, the Razer Turret makes up for it in performance and ingenuity. With the EagleTec K104/KS04 keyboard and mouse combo, we have another set that is both affordable and reliable. Not only is this among the best budget mouse and keyboard combo packages, but it has similar, if not more, features than other selections on this list. The keyboard operates on a 2.4 GHz frequency, giving it a lot more range than the average wireless keyboard. Both the keyboard and the mouse also connect through the same USB nano-receiver. The nano-receiver can be stored at the underside of the mouse. The keyboard is splash resistant with 2mm keystrokes. Both devices are also plug-and-play, allowing for easy installation and immediate use. The keyboard also features 12 programmable function hotkeys that you can assign to media or other functions. The package also includes an MRM2509 mouse, which is a quality device for the price of the package. The mouse also connects through 2.4 GHz, with DPI switch for 1000, 1500, and 2000. The mouse also features a five button design and an ergonomic shape. It has rubber grips at the side for comfortable use and an automatic sleep feature when not in use (simply click to wake up the mouse). 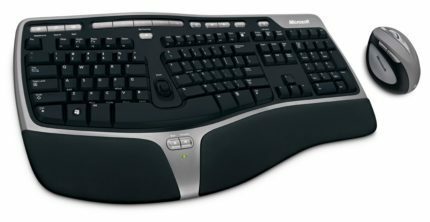 The Microsoft Natural Ergonomic Desktop 7000 kit is without a doubt the most comfortable and stylish keyboard and mouse pair in the market. Both devices are beautifully designed to give the user the best ergonomic position when using the computer. The advanced design allows for the optimum hand, wrist, and forearm position for the finest comfort and ease. 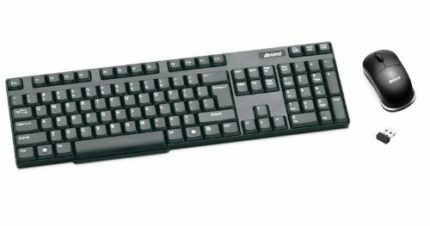 The wireless keyboard has programmable function buttons for media and other applications. It also features an indicator light for batter life. It also features additional buttons such as a “My Favorites” button in the middle, back, and forward browsing buttons, and a zoom toggle switch. The keyboard also features AES technology (Advanced Encryption Standard). The mouse uses high definition laser technology for better tracking and responsiveness. It also features four-way scrolling on the tilt wheel for better efficiency and another magnifier toggle on the mouse. The mouse’s ergonomic design makes it as fit your hand “as naturally as a handshake”. Both devices are connected through 2.4 GHz frequency on a nano-receiver USB, and both are also powered by AA alkaline batteries. This is one of the best wireless combinations on the market, but it is also one of the most expensive. 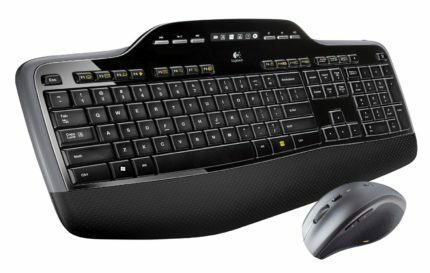 The Logitech Wireless Wave Combo is considered to be one of the best wireless keyboard and mouse combination pack choices in the market. The pair hits one just about every aspect. It has ergonomic comfort, media and application hotkeys, impressive battery life, and its price does not break the bank. It checks all the marks for a reliable and solid wireless keyboard and mouse package. 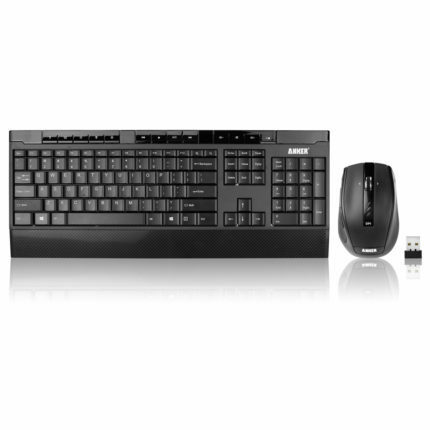 The Wave combo features the Logitech Mouse M510 and the K350 keyboard. The Wave design makes the keyboard and mouse ergonomic and elegant. The additional cushion palm rest of the keyboard adds additional comfort when using the devices and the curved design is perfect for the natural typing position. The keyboard also features an LCD dashboard that informs the user of keyboard locks and battery power life. The laser mouse is equipped with contoured rubber grips for precise control. Both devices connect via 2.4GHz frequency on the Logitech unifying receiver, which allows up to 6 compatible devices to connect to the USB nano-receiver. And the best part of this is its battery life. Similar to the other Logitech device reviewed in this article, the pair uses standard pre-installed AA batteries that can last as long as three years. When it comes to wireless keyboards and mouse packs, there are definitely a lot of variations and options. The best combo for you would depend on your current PC needs, your budget, and your preferred style. If you’re working with a limited budget, then Inland Pro Wireless 2.4 GHz Keyboard and Mouse is the best package. For your gaming needs, the best would be the Razer Turret Wireless Keyboard and Mouse. If you’re looking for the best comfort for casual computer usage the Microsoft Natural Ergonomic Desktop 7000 would be best. For everyday business comfort then the Logitech Wireless Desktop MK710 is the combo for you, but if you want the best of all possible features and if you want to get the most for your money, then the Logitech Wireless Wave Combo MK550 is your keyboard and mouse combo pack.